Come make some beats (and some noise!) in the kids room with us! 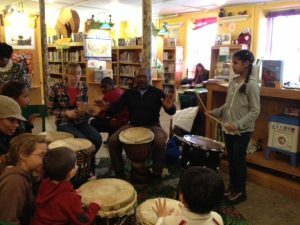 Kuumba Dance and Drum, a performing arts program of Operation Unite, will be joining us in the kids room on Tuesday, November 26 from 5:00 – 6:00pm. Come learn how to play traditional African music on the drums with us. Children and families of all ages are welcome to help us make some music! Make Some Noise (Yes, Really!) In The Library! Come make some beats (and some noise!) in the kids room with us! Kuumba Dance and Drum, a performing arts program of Operation Unite, will be joining us in the kids room on Wednesday, July 17 from 5:30 – 6:30pm. Come learn how to play traditional African music on the drums with us. Children and families of all ages are welcome to help us make some music!